Insist on the original …. Invented by Messrs BERGOUNHON. "Mastery and technical know-how, the GYPSOTONNE edge with the vertical kiln that is undergoing continued development”. 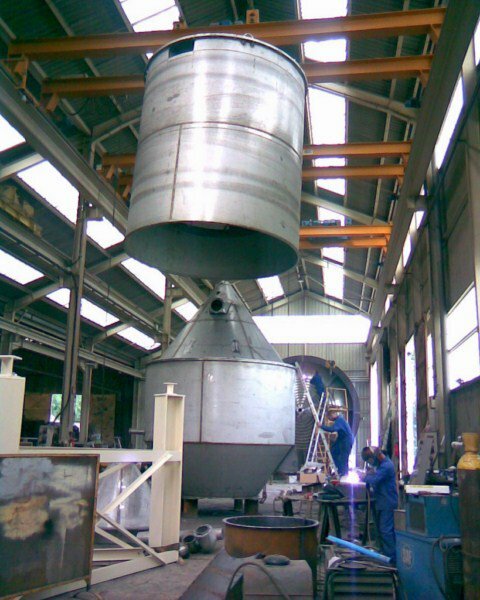 > The technical characteristics of our plaster calcining kiln. Low ground footprint, easily incorporated into an existing unit. No moving parts in the kiln enclosure, no wear and very low maintenance. • The continuous operation kiln. 180 or 450 tonnes of plaster/day. No need for buffer stock. 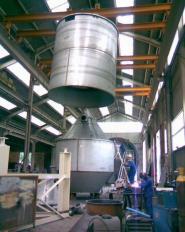 A crusher can be installed directly at the kiln outlet. The kiln is supplied with its base and is installed on a simple concrete screed. • Simple and quick to install. 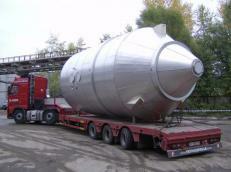 The kiln is delivered pre-assembled, its installation on site and commissioning take 2 weeks. • Heated by gas burners. The gypsum is calcinated at a 320 to 380 mbar pressure in a water-saturated atmosphere thus giving the plasterexceptional mechanical and flow properties, equivalent to a mixture containing 75% Beta plaster and 25% Alpha plaster This allows the use of a W/P mixing ratio = 0.65 without the need for additives (65 grams of water/100 grams of plaster). Compared with the ratios applicable to mixes using plaster calcined in conventional, rotary or other type, kilns in the region of 0.8 to 0.85 where Alpha plaster is not used. Moreover, the mechanical properties achieved with plaster calcined in our kilns will produce plaster finishes and tiles of high natural hardness. It is also obvious that using less water in order to achieve the same flow, will produce substantial energy savings for example when drying plaster tiles. Guaranteed consumption of 186 kW(160 th)/Tonne of gypsum, or 223 kW (191,7 th) per Tonne of plaster. This particular energy saving feature will enable the client to very quickly see a return on his plaster calcining installation. GAS CONSUMPTION: 22.3Nm3 of gas/tonne of plaster. (Figure provided for 97% pure gypsum and a gas net calorific value of 8.6 thermies/Nm3). Nm3 = Normal cubic metres (For gas at atmospheric pressure, that is to say not compressed). • Longevity guaranteed by the fully stainless steel design. 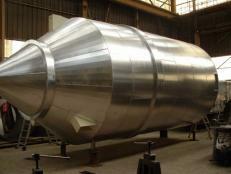 Entirely constructed of 18-10 stainless steel and refractory stainless steel in the case of the combustion chamber). The entire assembly is completely heat insulated. 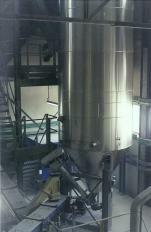 Filtration integrated into the kiln. Unclogged using compressed air at a 6 to 7 bar pressure. A special feature of these kilns is that they can easily be switched off, for example, in the evening and restarted the following morning. Consequently, this flexibility means that output can be adapted to suit plaster demand and requirements. This unique feature means that clients enjoy unparalleled output management options. • The plaster and phosphogypsum waste recycling option. It is possible to feed these kilns with, for example, waste produced by boards packaged in cardboard (used to produce partitions in dwellings). 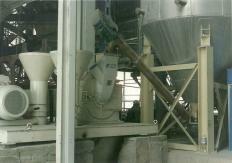 This waste is crushed and mixed with natural gypsum at the rate of 10 to 20% of the volume processed. Phosphogypsum is also a product that our kiln can process when it is mixed with natural gypsum ate the maximum rate of 50% of the volume to be processed. (Phosphogypsum is the gypsewhich is not a natural product and which is produced by the industrial processing of fluorophosphates calcium ore for manufacturing acide phosphorique and engraisphosphatés). 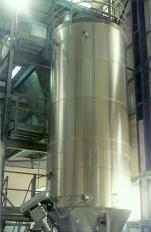 Complete plaster production unit comprising a GYPSO 180 and 450 T calcining kiln. For calcining purposes, gypsum must have a 0 – 5 mm particle size. 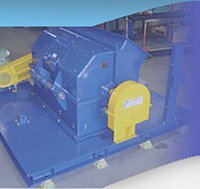 Preliminary crushing :A block buster breaks 0 to 300 mm blocks into fragments measuring 0 to 60 mm. 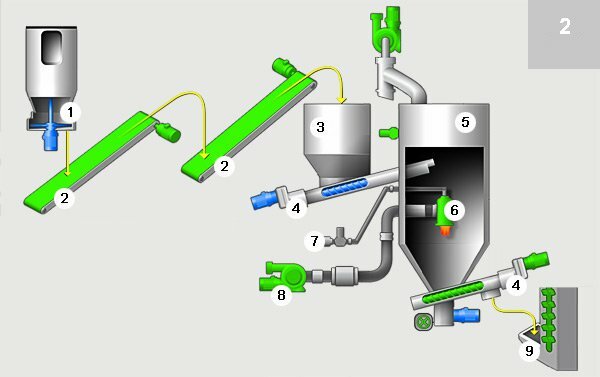 Secondary crushing : A second hammer crusher reduces these fragments to a 0 – 5 mm powder. 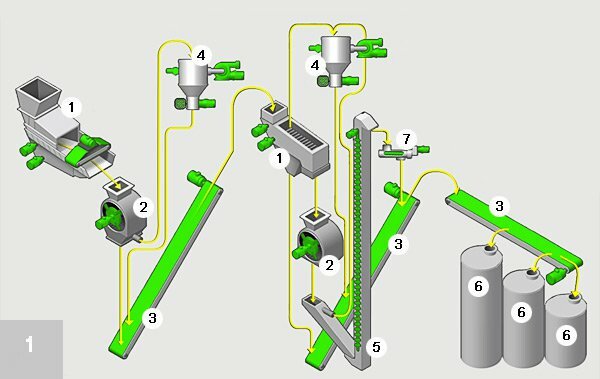 The raw material is continuously metered. 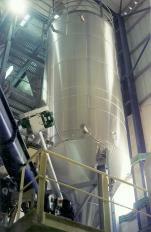 Located at the bottom of the feed hopper, a screw injects gypsum into the top section of the kiln. The gypsum flows vertically into the ring that surrounds the central combustion chamber and through the mixing chambers where it is constantly being mixed. A flame burner in the top of the kiln generates hot gases that circulate through the central part of the kiln and then through its outer ring, flowing against the gypsum direction of travel. The gypsum is dewatered as it flows downwards, producing plaster in the lower section of the kiln. A screw mounted on the base of the kiln extracts the plaster. This special plaster calcining system, using radiation and contact with the hot gases in a very humid atmosphere at a 320 to 380 mbar pressure inside the kiln, endows the plaster with extremely interesting and specific properties. A cooling unit can be installed at the kiln outlet if necessary. 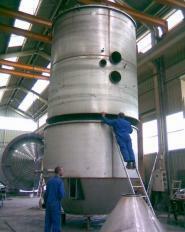 Cold air is then used to cool the plaster indirectly in a rotary drum. This equipment will lower plaster temperature from 160 to 80°C or less. This provides for a faster and more controlled use of the plaster, a feature that is essential when chemical additives are blended into the basic plaster. After calcining, the plaster is crushed to a more or less fine extent – depending on its target application. As a rule, two particle sizes are offered: 200~ and 600~ (1% rejected by screening). 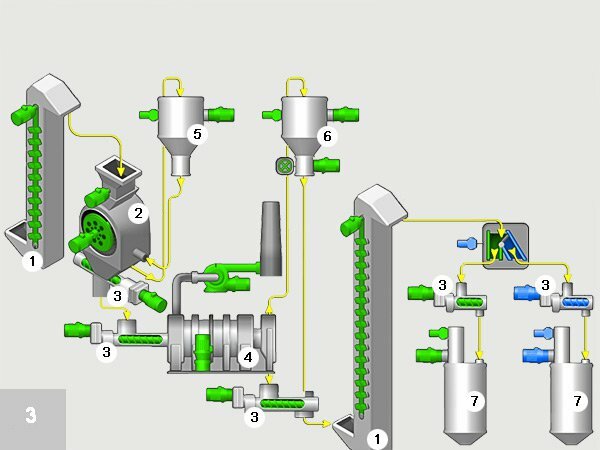 Crushing to 200µ : Crushed using broach crushers and a dynamic separator used to recycle the larger particles. Crushing to 600µ : crushed using hammer crushers and a screen used to recycle the larger particles. Our installations allow the largest particles to be recycles; they ensure that a very even particle size is achieved. Depending on your requirements, the crushed plaster can be conveyed pneumatically to a storage silo, routed to a bulk loading system or packed in 5, 10 , 25 , 30 or 40 kg sacks. 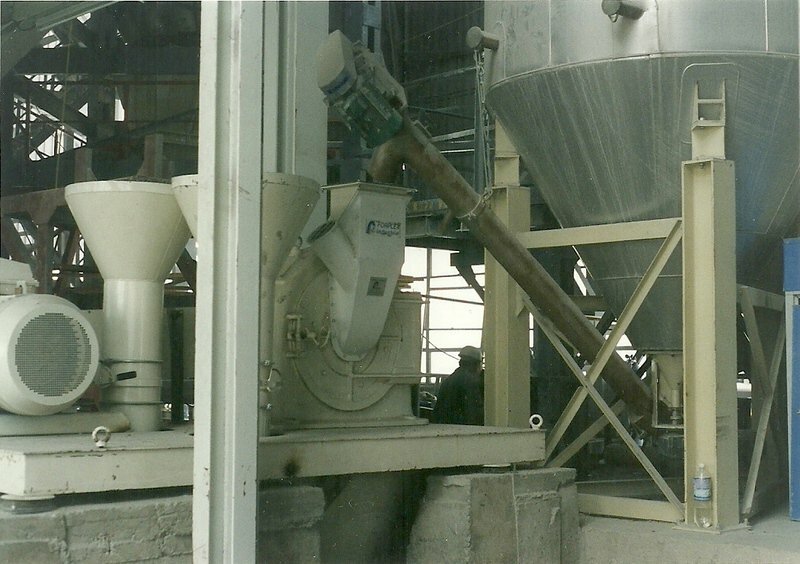 Baggers – usually consisting in manually offering up the sacks and automatic ejection – have been specially designed so that they release as little dust as possible. Finally, the sacks can be loaded direct onto lorries, stacked on pallets manually or automatically, shrink-wrapped or not.